NAR is actively seeking to recruit and retain young professionals into real estate careers. The national network is guided by the YPN Advisory Board, national leaders committed to advancing that mission, as well as the YPN vision. Advisory Board members apply through the NAR committee selection process and generally serve a one-year term, reporting to NAR’s Member Communications Committee. YPN offers newer practitioners opportunities to test and hone their leadership skills. Many REALTORS® who get their start in YPN go on lead their local or state associations or to participate in NAR’s Leadership Academy, a year-long, selective-admission program for up-and- coming REALTOR® association leaders. NAR also seeks out YPN members to serve on a wide range of committees. If you’re interested in advancing the real estate profession, protecting and promoting private property ownership, and strengthening communities, YPN is a great place to start. Throughout the country, real estate professionals are getting involved in YPN as a way to build their leadership skills and contribute to their industry and community. Find a YPN in your area. 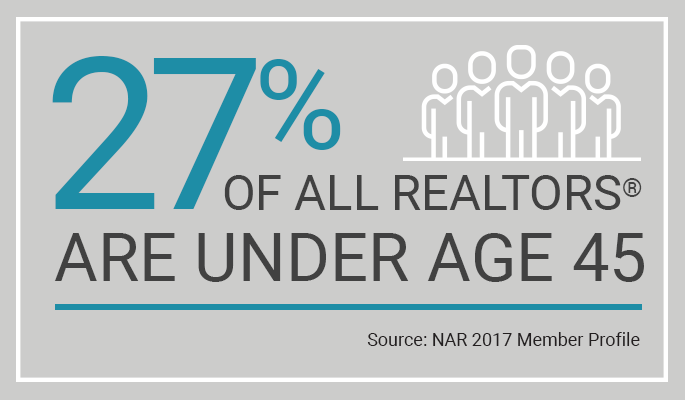 How Many REALTORS® Under Age 45?